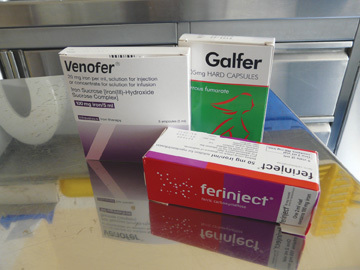 These are just examples of some of the drugs available. 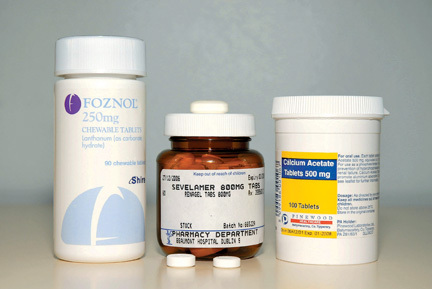 Medications have different brand names so it is important to realise that different coloured medication may be given while in hospital. Calcium containing compounds. 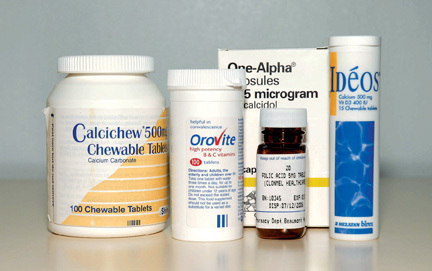 These calcium tablets are effective at binding phosphate but, sometimes, can cause the calcium level in the blood to go too high. These tablets may cause constipation or gas. They are chewed and taken with meals. Sevelamer (Renagel). This tablet is swallowed and not chewed. Frequently you may have to take as many as 3 tablets, 3 times a day. This tablet may also cause some constipation or abdominal discomfort. 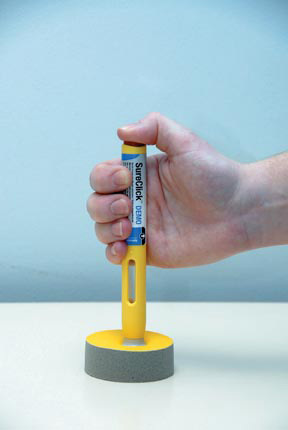 It has the advantage over other phosphate binders in that it does not contain calcium. Foznol is also another phosphate binder commonly used. Betablockers are amongst the most commonly prescribed blood pressure medications. Examples include Atenolol and Metoprolol. 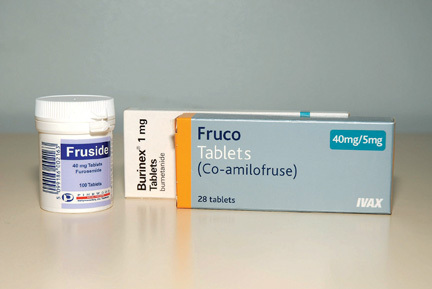 These tablets are used to treat cardiac conditions in addition to high blood pressure. Betablockers work by blocking the effect of adrenaline on blood vessels and the heart. Consequently, they will slow the heart a little. People with severe asthma need to be careful with these medications as they may make asthma worse and they may also, occasionally, make your hands feel cold. Occasionally, betablockers may give you nightmares. Calcium channel blockers work by directly making blood vessels relax by blocking calcium going into muscles around the blood vessels. The commonest sideeffect of these medications is swelling of the legs. They may also, occasionally, cause redness of the skin. Alpha blockers work by blocking the function of adrenaline on blood vessels. Occasionally these medications may cause you to become dizzy when you stand up. One of the important hormones in the body that controls blood pressure in the body is called angiotensin. ACE inhibitors work by blocking the production of this hormone and ARB work by stopping the effect of angiotensin. These drugs are used to treat blood pressure and heart failure. They are also effective at slowing the decline in kidney function. ACE inhibitors may sometimes cause a persistent cough which resolves when the ACE is stopped. These medications may also cause the potassium levels to rise too high. Your bloods will be carefully monitored for this. Diuretics are medications that make you pass more urine. These medications are used to treat swelling of the legs, heart failure and are also commonly used to treat high blood pressure. Diuretics can also be prescribed for patients who are on dialysis which help produce more urine and gain less weight between dialysis treatments. These medications will work for up to six hours after they are taken. Side-effects of diuretics include dehydration if they make you pass too much urine. Patients, who are on dialysis, commonly lose much of the water soluble vitamins through the dialysis machine. It is important that you do not take just any multivitamins as some of these preparations may contain too much of the fat soluble vitamins. Folic acid is important for many of the metabolic functions of the body. The kidney is responsible for converting the vitamin D that is in your body into the active form of vitamin D. People with kidney disease lack the ability to produce the active form of vitamin D. Vitamin D is important for the absorption of calcium and for bone health which is important to prevent the parathyroid glands becoming overactive. As mentioned earlier the parathyroid (PTH) glands are small glands in your neck that control calcium levels in your body. People with kidney disease can have PTH levels that are too high. One of the major functions of Vitamin D is to lower PTH levels. Too much vitamin D may cause the calcium, in your blood, to go too high so your doctors and nurses will be carefully monitoring calcium levels by obtaining regular blood samples. Patients with kidney disease very often have a low blood count. Under normal circumstances the kidney produces a substance called erythropoietin (EPO). 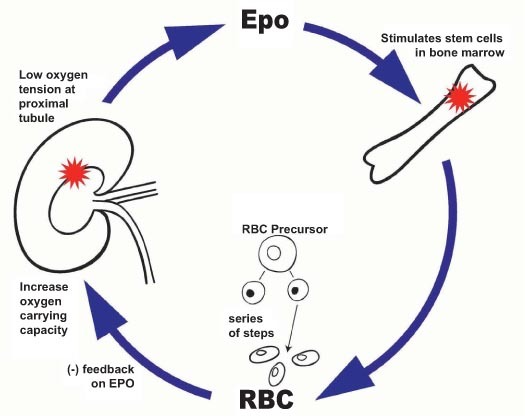 EPO works on the bone marrow cells to make more blood cells. EPO needs to be administered by way of an injection. It cannot be taken as a tablet. The injection may be given as an injection directly into the dialysis machine or as an injection into the skin. EPO can be administered either once, twice or three times a week or sometimes every second week or, even only once a month, depending on your blood. Patients will feel much better on EPO as they will acquire more energy with a higher haemoglobin. EPO is prescribed on a high-tech prescription. 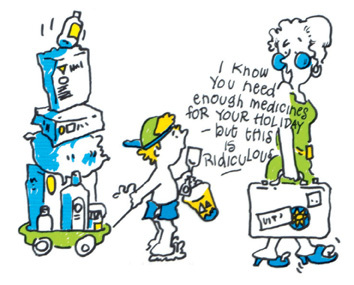 Your chemist will give you 4 or 5 vials, which you will need to keep in the fridge (not the freezer). Your kidney nurse will either teach you how to administer the medication yourself or arrange a district nurse or your GP practice nurse to administer it. It is also possible to have your injection when you attend for dialysis. It is important to stay on this medication until your doctor indicates otherwise. You will need frequent blood tests to monitor the effectiveness of the EPO as too much EPO may cause your blood to go too high or you may need to increase the dose if you are not getting enough benefit. It is important that you bring your medication with you on admission to hospital or for each dialysis treatment if required. EPO is extremely effective at increasing your blood count. However, in order for the EPO to work effectively your body needs to have enough iron. It is difficult for your body to take in enough iron through regular diet for the EPO to reach full effect. Your doctor may prescribe oral iron. Iron tablets can be a little unpleasant to take as they may make your stomach upset or cause you constipation. Iron tablets will also make your bowel movement black and tarry. If you cannot tolerate iron tablets or your doctor determines, by blood test, that you are still low in iron, you may be prescribed intravenous iron. If you are on haemodialysis, you will be given iron directly into the dialysis circuit. As we discussed under Vitamin D, your parathyroid glands are four small glands in your neck that control the level of calcium in your blood. In kidney disease, parathroid (PTH) hormone tends to increase. When this happens, it can have a number of effects, including weakening of your bones and causing pain in your bones and joints. In the first instance, your doctor may give you vitamin tablets (Rocaltrol or One Alpha); however, if these do not work, it may be necessary to receive Vitamin D intravenously (Zemplar) directly into the dialysis machine. If these strategies are not adequate, your doctor may advise you to take another drug called Cinacalcit (Mimpara). This drug is extremely effective at lowering PTH level. 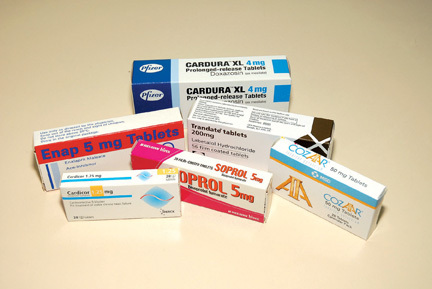 The main side effect of Cinacalcit is that it may cause a little nausea after it is taken. This, generally, settles down after a few days. Occasionally, if these drugs are not effective in controlling your PTH level, your doctor may recommend an operation toremove part of your parathyroid glands (a parathyroidectomy). â—� NSAIDS or anti-inflammatories should be avoided. Examples of these would include: Ponstan, Neurofen, Ibuprofen, Advil, Difene, Voltarol, etc. For pain control you should take simple analgesics such as Panadol or Solpadeine. If you need something stronger, speak with your doctor. It is very important that you know your medications and how they work. Your healthcare team will work alongside you to achieve this.